Summary: Much drier pattern than we’ve had the last several weeks. Small chance of rain mid-week. Great looking weekend coming up. Say bye to the rain-chance-every-day setup we’ve had and welcome to a much drier and calmer weather period for the next seven days! Today, temperatures will warm up to about 68 degrees under sunny skies with not a rain cloud in sight. Winds will be coming out of the north northeast at 10 mph. Tonight, clouds will start to increase as our low falls to 46 degrees. Winds chill out a bit at 5 to 10 mph out of the north northeast. Tuesday and Wednesday brings rain back in the forecast. 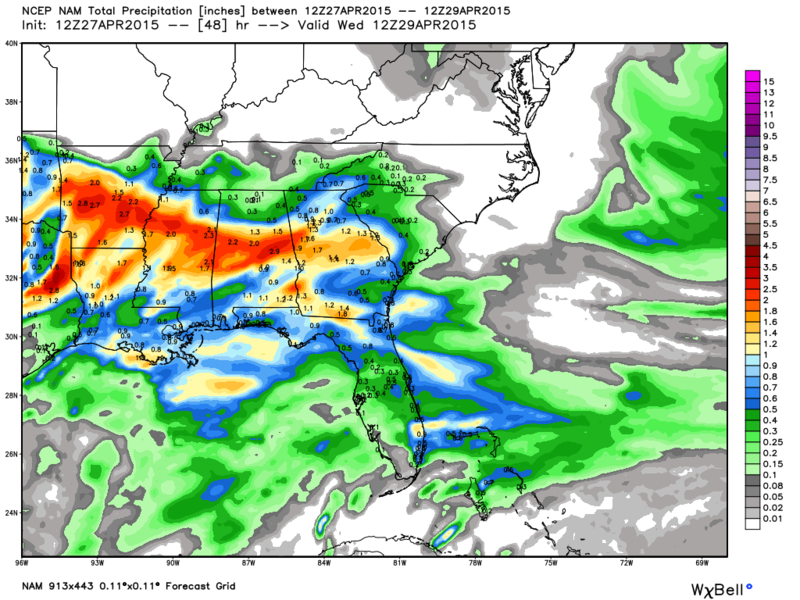 Very small rain chances creep back into the forecast for Tuesday, Tuesday night and Wednesday as a system works its way through Mississippi, Alabama, and Georgia. 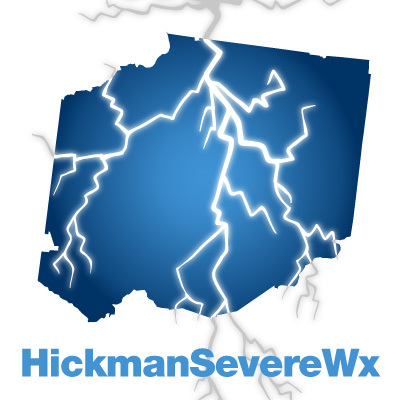 Tuesday our high will be about 65 degrees with a 30% chance of rain showers (no thunderstorms). Winds will be a bit breeze at 10 to 15 mph out of the north northeast. Tuesday night into Wednesday carry the greatest chance of rain, but thankfully this rain does not carry a chance of severe weather. Tuesday night rain chances jump to about 70% as rain is likely. Tuesday’s low will be 49 degrees with winds still coming from the north northeast at 10 mph. 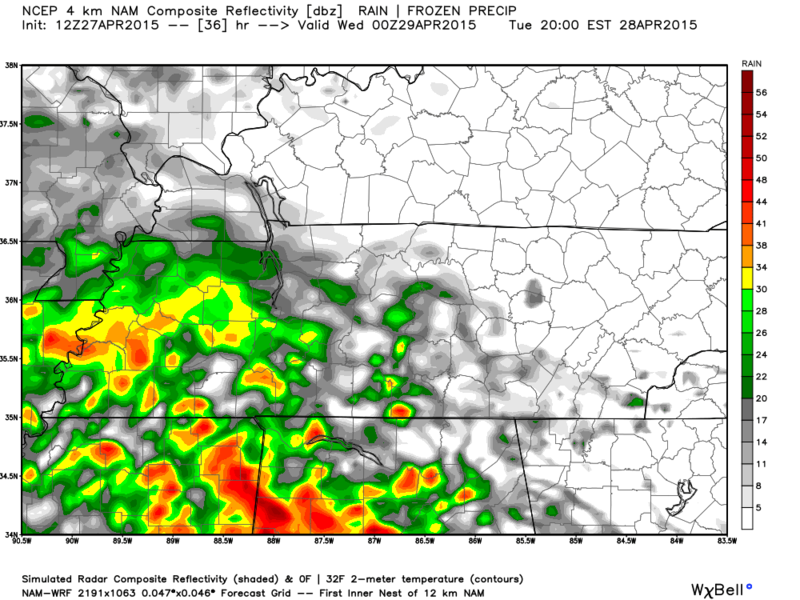 Here’s NAM4’s simulated radar for 7pm Tuesday night showing scattered showers. Wednesday we will see a 50/50 chance of rain with our high temps reaching about 64 degrees. Winds will be out of the north at 10 to 15 mph, with some gusts reaching about 20 mph. Rain moves out by Wednesday night, as lows drop to 49 degrees under mostly cloudy skies and a 5 pm north northeast wind. All in all, it doesn’t look like we could see too much rain from Tuesday night and Wednesday. Currently estimating about .25 to .75 inches. The weekend is looking great from here. The end of the workweek will be better as only a slight 20% chance of rain is in the forecast for Thursday. Friday, Saturday, and Sunday currently looks rainless with temps soaring from 69 on Friday to 77 on Sunday.